Far from the fictional domain of J.R.R. Tolkien's Middle-earth sits an entirely different kind of refuge for diminutive creatures: Hobbitland, an indoor playground on the eastern edge of Chicago's Humboldt Park neighborhood. 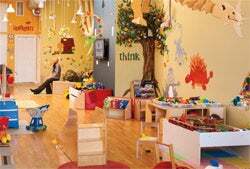 A cozy but organized 1,200-foot space dominated by colorful murals, eco-friendly wooden toys and a massive cardboard dinosaur that hangs from the ceiling, Hobbitland welcomes 10 to 15 children each day, all between the ages of 6 months and 6 years. Hobbitland welcomes their parents as well, offering free coffee and tea along with free Wi-Fi access. "It's like a club--we have members from all around the neighborhood," says Anna Syroczynska, who owns and operates Hobbitland with business partner Sophie Augustynowicz. "The idea is that we want to have a home atmosphere. It's very friendly. Parents can come here to relax." Parents can further relax knowing Hobbitland doesn't require reservations. Instead, Syroczynska and Augustynowicz offer passcards. A two-visit card is priced at $20 per child, a three-visit card is $30, and so on, with discounts for multiple children. There are also 30-day memberships starting at $65 per child. Like many small businesses, Hobbitland also features a loyalty program that rewards regular customers with free visits and other perks. With so many parents carrying smartphones, Hobbitland is now teaming with mobile marketing startup Stampt to transition from conventional paper loyalty cards to an iPhone-based rewards model. "Everybody has the fancy phones now," Syroczynska says. "You can do so much stuff that way." Hobbitland is one of about 500 businesses across the U.S. offering the Stampt service, which launched in July. Stampt consolidates multiple merchant loyalty cards and rewards programs into a single iPhone app--each virtual card and offer is unique and branded for that particular retailer or restaurant. Customers who've downloaded the free solution from Apple's App Store simply pull out their smartphone at the point of sale and wave it in front of the Quick Scan Card (provided by Stampt and roughly the size of a credit card)--the app records their visit and reward-eligible purchase, "stamping" their digital card in the process. "Consumers are always losing or forgetting their loyalty cards, or carrying too many around," says Stampt CEO Brian Kelly, a data analytics and consumer-behavior-research veteran who co-founded the San Francisco-based firm with his nephew, Trey Kelly. "Having everything in one digital place means you don't forget your cards or lose them, which means you're inclined to use them more often. When it's as easy as pulling out your phone, you'll do it." The Stampt app requires no systems integration and about three minutes of training for store employees. It also leverages other capabilities of the mobile channel--for example, identifying merchant partners within the consumer's immediate vicinity and connecting users to Facebook and Twitter. Stampt also supplies usage metrics and digital insights, as well as real-world support like signage and window stickers. As of mid-August, about 5,000 iPhone owners had downloaded the app, all thanks to in-store promotion. "The percentage of people downloading it and using it is very high," Kelly says, adding that Stampt plans to expand to Google's fast-growing Android operating system by year's end. The basic Stampt service is free to all merchants--the company seeks to generate revenue by offering a premium version, complete with deep-dive analytics and support for special offers and related direct-marketing initiatives, although that, too, is free to the first 1,000 signups for the first year. "Consumers love Stampt. It's fast, it's easy to use and we've purposely kept it very simple," Kelly says. "Merchants get the value right away. When we tell them what it does for them, they can't think of a reason to say no." Although Hobbitland is a new convert to Stampt, Syroczynska has no doubt it will soon emerge as the coin of the realm. "People use their phone for everything now," she says. "It's our future."